For those who are interested in this wonderful legend here is more information which I will follow with the Poem The Bells of Cantre’r Gwaelod. In May 20l3 shortly after the first set of storms to hit Britain there appeared what looked like many spikes protruding from the sands at a well known site in Borth Wales These were tree stumps exposed from a prehistoric forest, which had been flooded some 5,000 years ago by rising sea levels after the last Ice Age. The stumps previously disappearing from the sands for many years through the coming and going of the tides. There is a poem children in Wales learn about the sunken kingdom of Cantre’r Gwaelod, swallowed by the sea and drowned forever after. On a quiet night legend has it, one can hear the kingdoms church bells ringing. 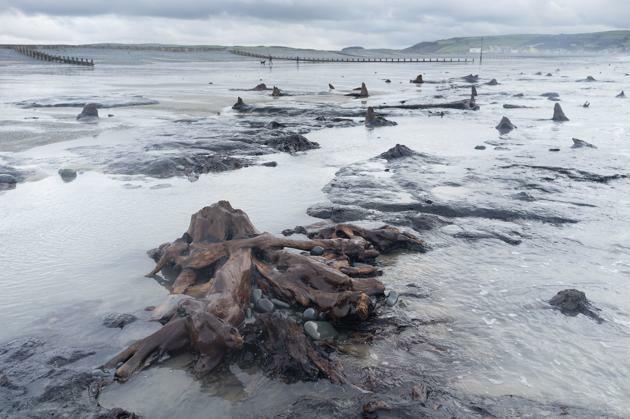 When the sea battered Britain’s coastlines during these storms many people were left homeless and lives lost, but the prehistoric forest tree stumps re emerged. An ancient forest as it would have looked . Just to think I have walked this stretch of sands with my children many times at Borth looking for fossils. Not even thinking there may have been a sunken kingdom we were walking on. Shortly after the first set of storms, Dr Nicholas Ashton ,Curator of the Paleolithic and Mesolithic collection at the British Museum commissioned Dr Martin Bates, a Geoarchaeologist at the University of Wales Trinity St. David to work on Britain’s East coast in Norfolk. The beach nr Happisburgh, a long standing archaeological site, had suffered severe erosion. Dr Ashton an expert in early humans, required a geophysical survey to map any channels and rivers that may lie beneath about 30 feet of sediment. Some of these channels, he believed may contain evidence of early humans because sources of fresh water would have natural gathering spots. 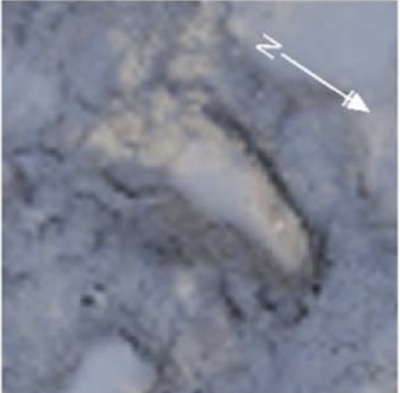 It was on the second visit May 10th 20l3, that Dr Bates noticed some indentations which looked like human footprints such as those found at Borth. 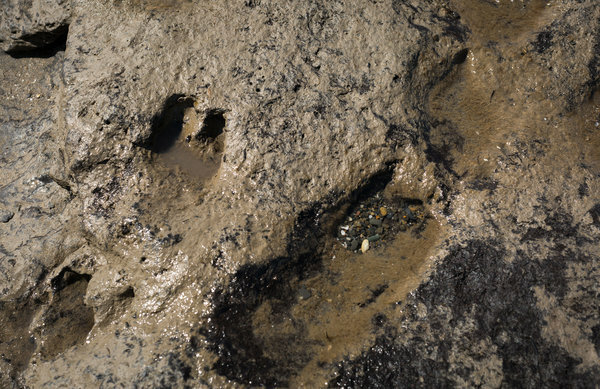 Footprints of humans and animals in Borth had been dated to around 6,000 years ago, the site in Happisburgh was about 900,000 years old, a time when mammoths and hippos still roamed in these parts. 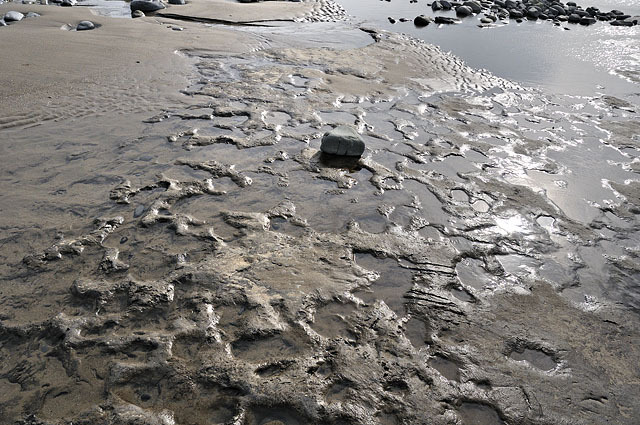 A close up of ancient animal footprints discovered at Borth. Wales. Standing on the ridge of Cardigan Bay in Borth, Dr Bates described what the area would have looked like at the height of the last ice age some 20,000 years ago: more than half a mile of ice overhead and dry land stretching across today’s North Sea. The sea level was 400 feet lower than today he said. You could have walked from Denmark to Yorkshire in those days, ” he said. About 10.000 years ago, temperatures warmed sharply, by eight to ten degrees Fahrenheit. By that time the European ice sheets had melted, but the much thicker North American sheets took much longer. While the climate had warmed to today’s levels, allowing mixed oak woodland to grow and humans to recolonize Britain, the sea level remained some 130 feet lower for another 3,000 years. When it did rise it would have been traumatic for the population, wiping out whatever settlement there was, and eventually the forest of Borth. The displaced humans of the time, Dr. Bates, said, were prehistoric refugees from climate change. Even in the reduced life span of the day, the coastline would have advanced dramatically, ” said Dr. Bates, who is convinced that the stories like Cantre’r Gwaelod originated in this period. Similar tales abound on the western European seaboard: There are Cornish and Breton versions, and variations of the theme exist in Jersey and the Orkney Islands. The ultimate legend of course, is Atlantis, which Plato placed somewhere in the North Atlantic. I uploaded these pictures a couple of weeks ago, but I’ve hesitated to share them. 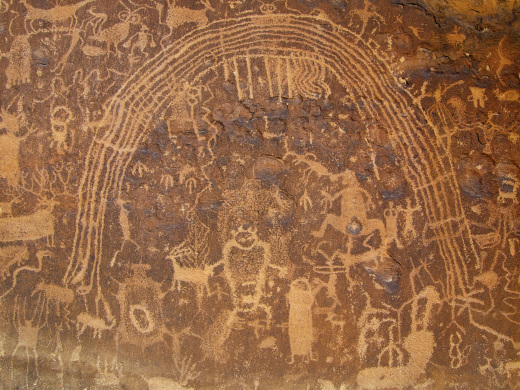 They’re very nice shots, but they pale in comparison to the subject matter – encountering this panel of finely pecked, richly detailed rock art, previously sight unseen (I had never laid eyes on a photo of the panel or read a description of this place) – was one of the most astonishing moments of my life. 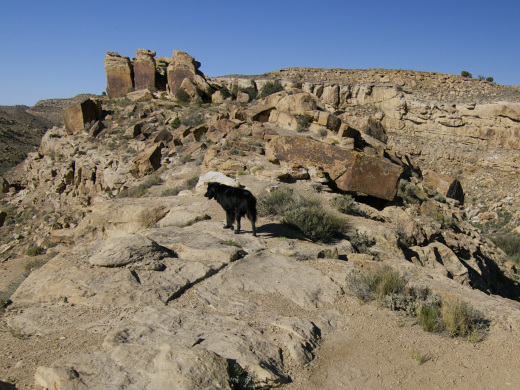 I followed some brown BLM signs that simply said Rock Art, down a long washboarded dirt road that ended abruptly at a canyon. An obvious, ancient footpath cut down canyon, winding between big blocks of brown sandstone, out to a prominatory above two creeks, both running thick and muddy. I have been working on a new Asahi Shimbun Display Dressed to impress: netsuke and Japanese men’s fashion that introduces the visitor to accessories that made men’s fashion a talking point during the Edo period (1615-1868). 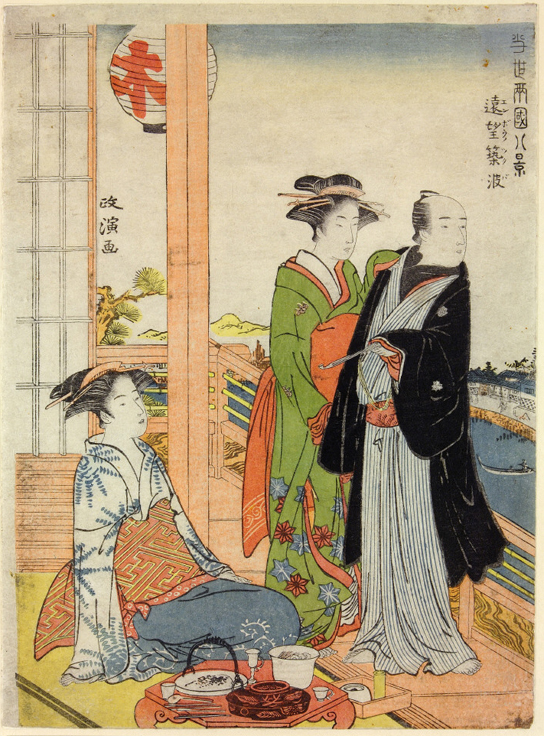 Although laws of the ruling samurai class strictly dictated garment choices for townsmen in Edo (now known as Tokyo), these plain garments could be offset with decorative additions, providing that they were worn discreetly or were hidden in the folds of their robes. 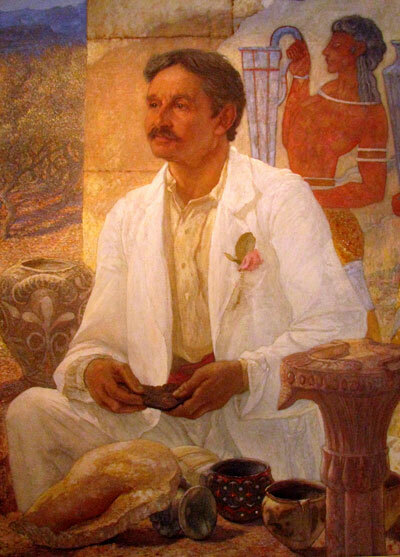 As an archaeologist the story of Arthur Evans excavation at the great Palace of Knossos fascinated me. It was only when I came to live in Crete to work on Minoan pottery that my attention was drawn to the Clay tablets which featured Linear B script which Sir Arthur had discovered. These tablets, around 800 or more, some found as fragments and some whole, tell us so much about a lost civilization. It wasn’t until I began learning to read and write these ancient scripts “still learning” ,that I realized the huge task which Arthur Evans had ahead of him in trying to decipher the writings upon the tablets, the strain on his eyes must have been enormous. However, Arthur Evans was not able to crack the code but he did lay the ground for Michael Ventris who eventually deciphered the tablets in l953. Actually, this was the very year I got married but did not know anything about this subject then of course . When Schliemann excavated the mainland Kingdom of Mycenae in the l870s, Evans was sure that such a civilization could not have existed without some form of writing and sure enough he was right. In l951, some forty clay tablets were uncovered at Mycenae ,in fact ,not far from where Schliemann had excavated, confirming that Evans had long been of the opinion that an advanced literate civilization had flourished. 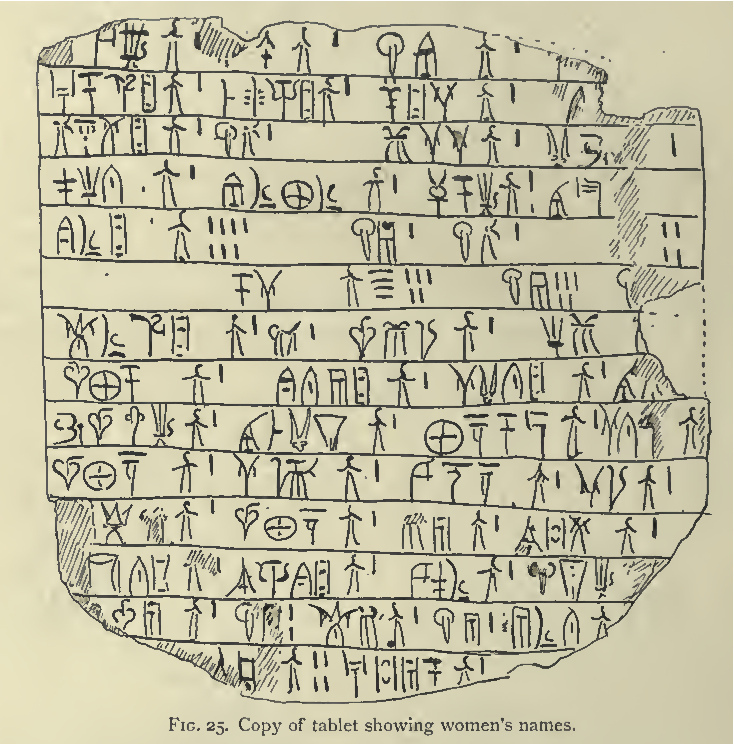 Some of these script writings have been found at Tiryns on the mainland and Thebes. Unfortunately the ancient scribes destroyed their work at the end of each year and the granules of unfired clay were then mixed with water leaving a paste from which the next years tablets were formed. Scholars have been of the opinion that before each set of tablets was destroyed, the years records may have been transferred to a more permanent place, written on parchment and stored, but this material would have disappeared long ago ,so whether the Mycenaeans actually did this can never actually be proved so we only have evidence of the final year of each Palace before any catastrophe that happened and the Mycenaean Age was reduced to ash. 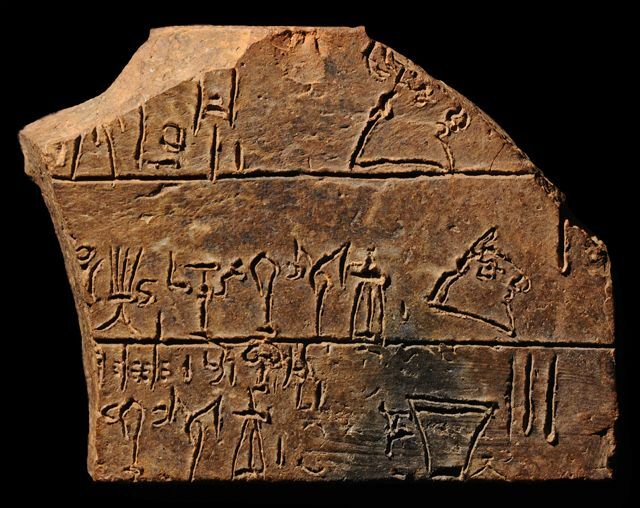 WHAT CAN WE LEARN FROM THE LINEAR B TABLETS. So far these ancient scripts tell us a lot about what the Minoan civilization did in their every day life. They tell us that most workers listed were men, but from those on which lists of women’s names appear, it is clear that certain occupations, such as textile work, were reserved for them. Women spun sheep fleece into woolen yarn and flax into linin then wove it into cloth on looms; men collected the cloth, fulled it and dyed it.The tablets also record tanners, and leather workers. Men made the leather into harnesses, while women stitched it into shoes and bags. There were sword makers for times of war, also bow makers, chariot makers and chariot wheel repair men. 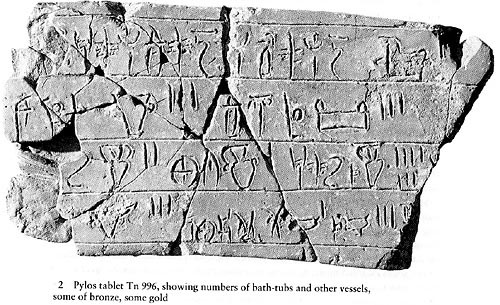 Linear B also tells us there were wood cutters, carpenters, shipbuilders, and net makers, bath attendants, hunters, herdsmen and bee keepers. 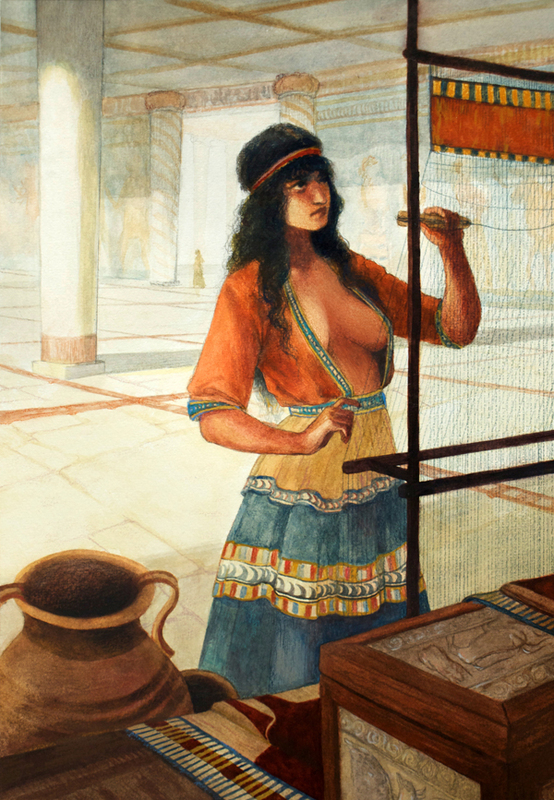 Serena Malyon’s interpretation of a Minoan woman weaving. Last but not least of these Linear B tablets. This one recording precious metal vessels. This Lions Hunt dagger shows the exquisite work of the Bronze age Minoans. 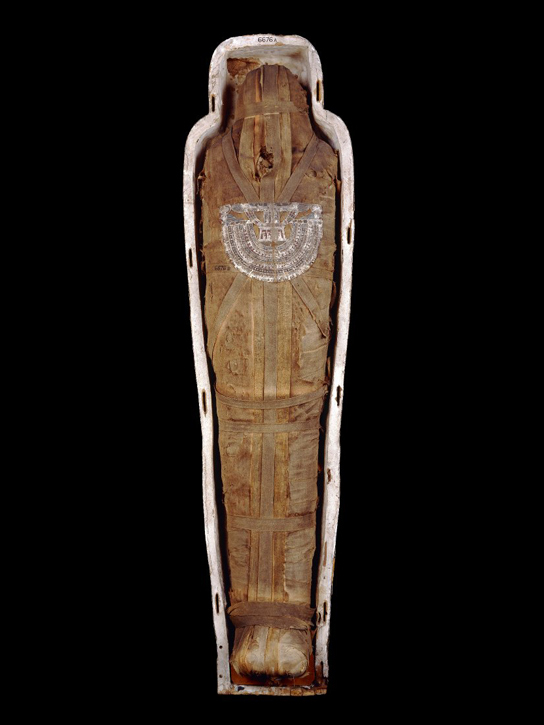 Mummy of a Priest of Amun and Bastet, named Penamunnebnesuttawy. Found at Thebes, Egypt, 25th-26th Dynasty, about 760-525 BC. (AES EA6676). 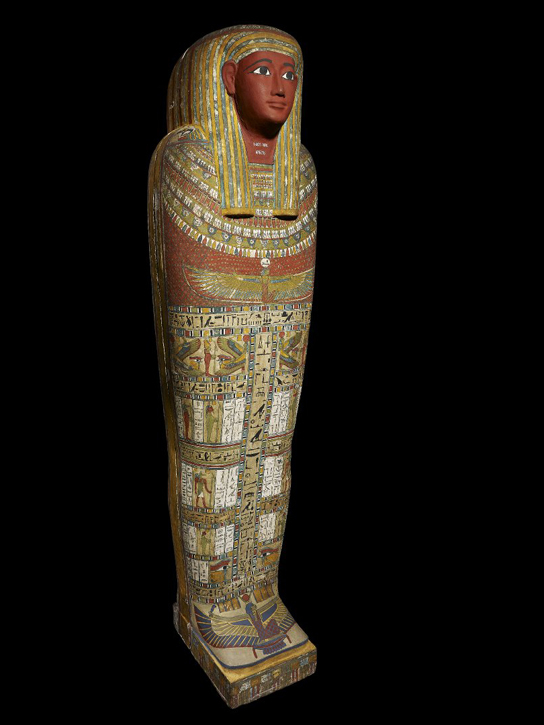 Shown with coffin lid removed. On my way from Hermit Peak to the Rio Grande Gorge, I got crunched between the Land Rover and the Teardrop. Ouch. 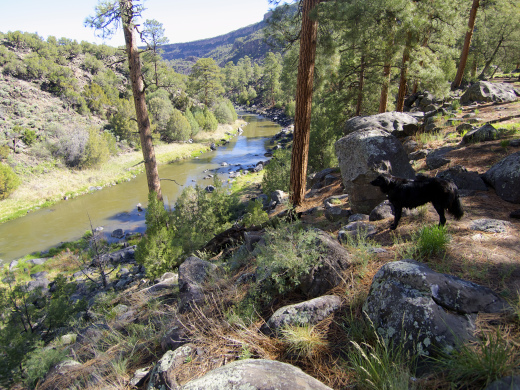 After a few days taking it easy on the long, flat roads that crisscross the east rim of the Gorge, I was ready to plunge headlong into that deep, dark river canyon. 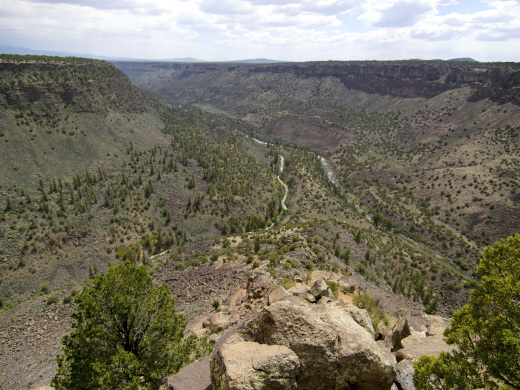 The Rio Grande River runs at the bottom of a 800 foot deep geologic rift that cuts down through the layers of black basalt that underlie north-central New Mexico. On the surface, the high desert is a sagebrush sea, cross hatched by dusty roads and antelope paths. But switchback down one of the steep footpaths that drop into the gorge and you’ll find a surprising green riverine paradise.